Taking a walk with children is sometimes a slow journey. The kids love to stop, look and explore nature, taking in all the sights and sounds. Last spring when my son first started walking, he spent a lot of time checking out all the bugs on the ground. He particularly liked watching the ants because they moved around a lot and he could easily follow them around on the pavement. We spent this week learning about ants and their habitat by reading a Smithsonian Backyard book about little black ants written by Wisconsin author Janet Halfmann. 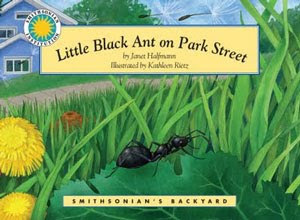 Author Janet Halfmann, through her non-fiction picture book, helps children learn about ant colonies and the life cycle of a little black ant (the common picnic ant). One summer a little black ant emerges from the colony and she searches for food along a city street. Her job presents several challenges including figuring out how to move a large, dead caterpillar and fighting a large carpenter ant. A bird scoops her in the air on a gum wrapper and she must find her way home. She and her friends feast on cookie crumbs and sweet juice from aphids. The busy ants work energetically all summer long and into the fall when they return below to winter underground. This is the first book we've read from the Smithsonian Backyard Series, and I'm very impressed by the writing and illustrations in this large paperback. This isn't written in the usual textbook non-fiction style, but instead reads exactly like an entertaining picture book. Little Black Ant on Park Street successfully introduced my children to a typical ant species. They easily became engrossed in the story of the little black ant, and they learned a lot of factual information along the way. Illustrator Rietz uses unique angles and perspectives in her colorful paintings and gives a detailed, almost microscopic look at the life of an ant. My preschool daughter asked several questions about the colony underground and loved seeing all the tunnels and rooms. My son focused longingly on the picnic cookie illustration and pointed out the ants carrying crumbs away. One page shows children quietly and carefully observing the ants, making sure not to disrupt or harm them. Several other species of plants and animals are featured throughout the pages and the last page highlights these as "Points of Interest." The last page also includes a more scientific summary about the Little Black Ant and a glossary defines a few of the key terms used in the book. The book is also available in hardcover or microbook format and a read-long CD/book combo or plush ant toy can be purchased as well. First we mixed up a batch of chocolate pudding using milk and the kids looked at the illustration of the ant colony in the book. 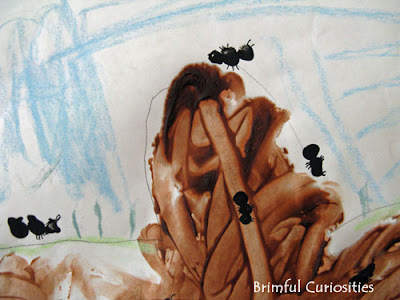 They made tunnels and the ant hill by smearing the pudding around with their fingers on a large piece of freezer paper. 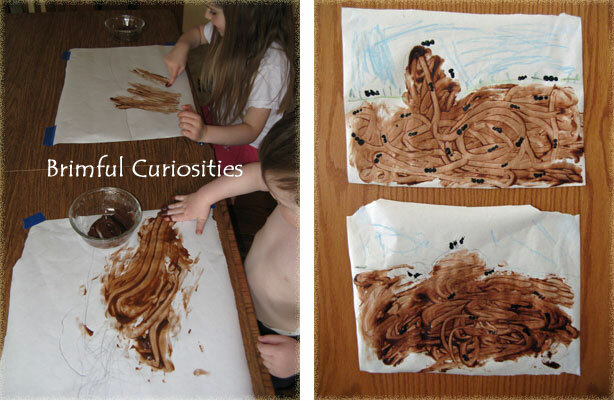 The pudding paintings dried overnight and the next day we used black paint to make fingerprint ants. On each ant we used a black marker to draw the antennae and six legs. The ants look very busy working away in their colony. The kids added a sky and some grass by coloring with blue and green sidewalk chalk. Maybe this summer we'll try making an actual ant farm! It looks so cute! 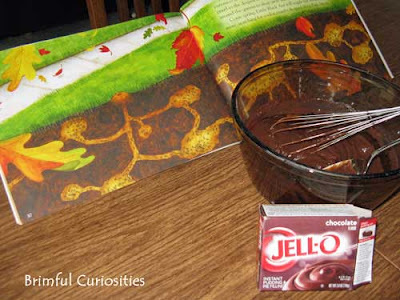 I'm not sure I could do the chocolate pudding mess, though. For some reason, mud seems more appealing than smeared chocolate. Thanks for the books series recommendation! We'll have to check it out. Very cute idea. My daughter enjoys painting with pudding too. Christianne and Zoe - actually it isn't a whole lot messier than normal finger painting and not too sticky. The painting dries nicely and, for once, the kids can actually eat the paint. This is a great idea! I'll have to try it with my girls done day! Great project! The book looks great! This is totally cracking me up! 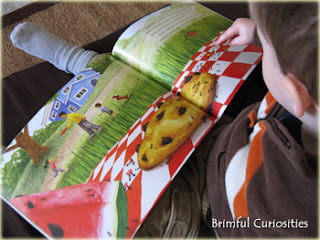 I am reviewing the same book and also planning on doing fingerprint ants for our related art project. You may just see ours linked up next week. Great minds think alike. Ours will not be in mud, however, although ER would probably just love that. Ours are going to be creeping up a letter A cut out. What a great idea. I don't know that I would have thought of using pudding. I love their little ants! What a fun and tasty project! hmmmm, now would my kids actually paint with it, or would they just eat it? That is the question. What fun ant colony activities. I'm so happy my book could inspire such wonderful art. Happy Reading! Looks like so much fun! What a great project to go with a book! Love it! Oh wow I love how this project turned out. I can't wait to check out this book and try the project with Emily!!! We have never painted with pudding, but I think she would LOVE it!! 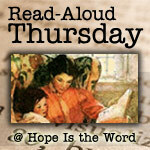 Thank you so much for linking up to stART and sharing your ideas. Oh...I used to do pudding painting with my oldest, I so need to get back into doing that with my youngest.